Sometimes I show up at just the right time! But only sometimes. Truthfully, I rarely show up at the right time. Usually I am somewhere and I see a gorgeous sunset about to happen, and I am in exactly the wrong place. I just happened to get lucky on this fine evening in Rome. We had been out and about doing whatever it is you do in Rome (in our case, lots of walking and gelato!) and were heading to this spot around sunset. I had already shot here the previous night and it was en route to our hotel, so it just worked out great. 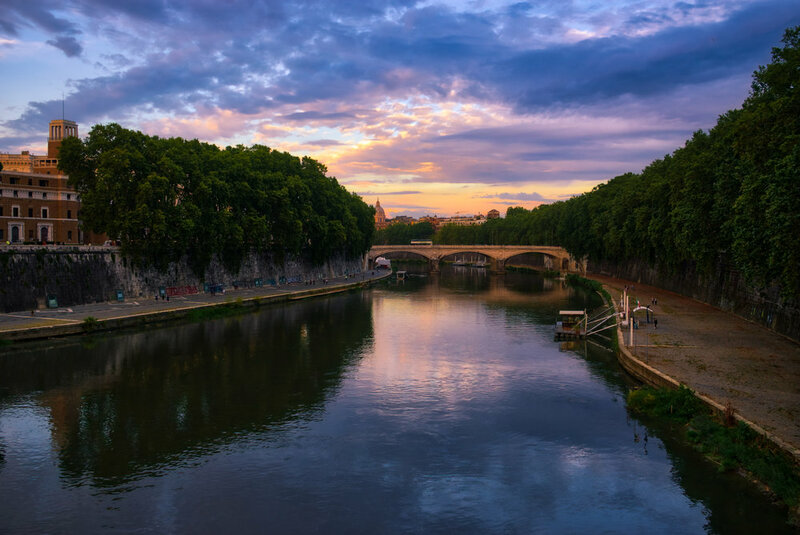 This is the view from the bridge that leads across the river to the Castel Sant'Angelo. The Vatican and all that stuff is behind me in this photo. While the light around the Vatican was nice, the sunset sky in this direction was just gorgeous.